A full on ride, and well worth it! Since there is no IBA New Zealand, there are no other special rides which we can do, so this one, being opened up to us caught my attention. Excited by the prospect I had started to try to plan a ride for ANZAC Day this year (25th April), but quickly hit a on a show-stopper of a problem. The rules require you to travel through places with names which align to the letters in A.N.Z.A.C – but we have no ‘Z’ based town or city names here in NZ. I made sure of this by checking the Land Information NZ website, and when I was certain that it couldn’t be done according to the current rules, I let the Australian group know. They responded in a very helpful and willing manner and offered to adjust the rules slightly to allow us to participate (as was always their intention). 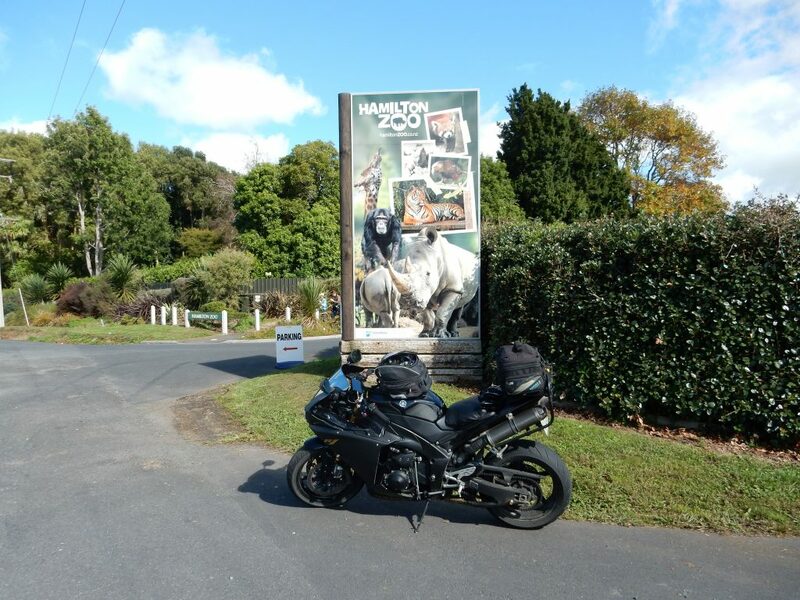 For us, they have allowed us to use any of the North Island Zoos, or if you’re in the South Island they’ve opened up the Z to include a photo of ‘Zig Zag Street’ in Christchurch. I was thrilled to be given an opportunity to participate in such a meaningful ride. A ride of remembrance. 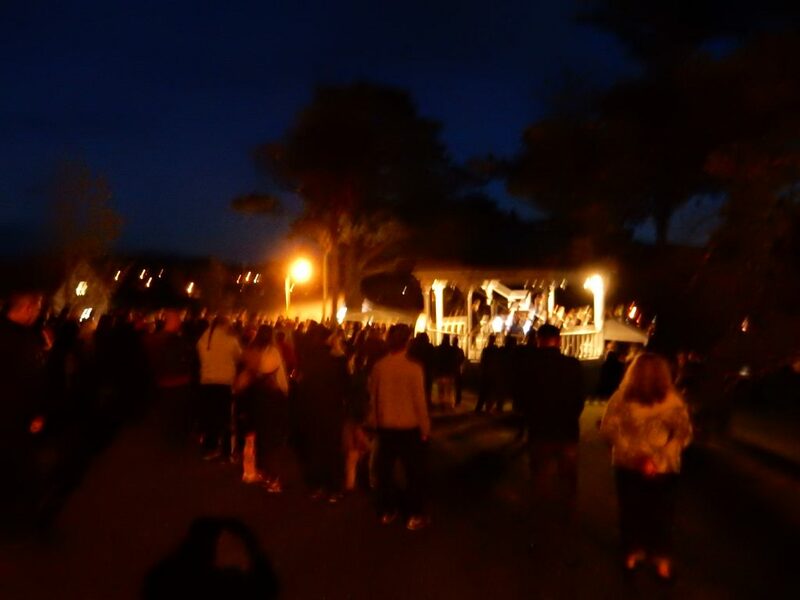 The ride rules also state that you must either start or end your IBA ride at an ANZAC Day, Dawn Parade. To make things even more touching, 2018 is a very special year for remembrance of World War I, being 100 years from the end of the war. The closest, most local ANZAC Dawn Parade is at our local town, Warkworth, where I also happen to be a member of the local RSA. Naturally, if I could attend the service there, that’s where I wanted to go. The choice attending the service at the start or the end of the ride was a simple one for me, the start of a ride is a known quantity, whereas the end timing of a 1600km ride is subject to so many influences, that planning to end at a service is a pretty mean feat. 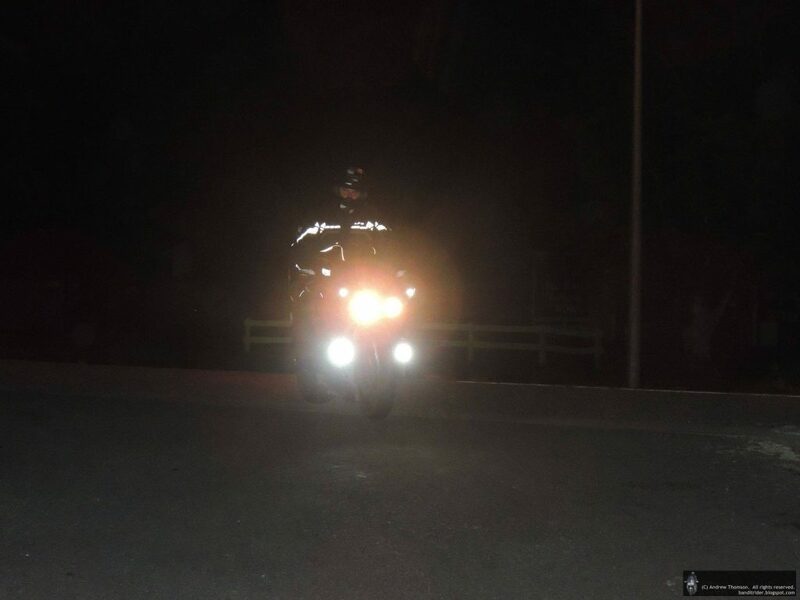 Also, by starting at dawn, you aren’t forced to ride through the whole of the night, only most of it, whereas if you were to end at the Dawn Service, then you’d have to ride through the entire night. So I decided to start at the Dawn Parade and work from there. 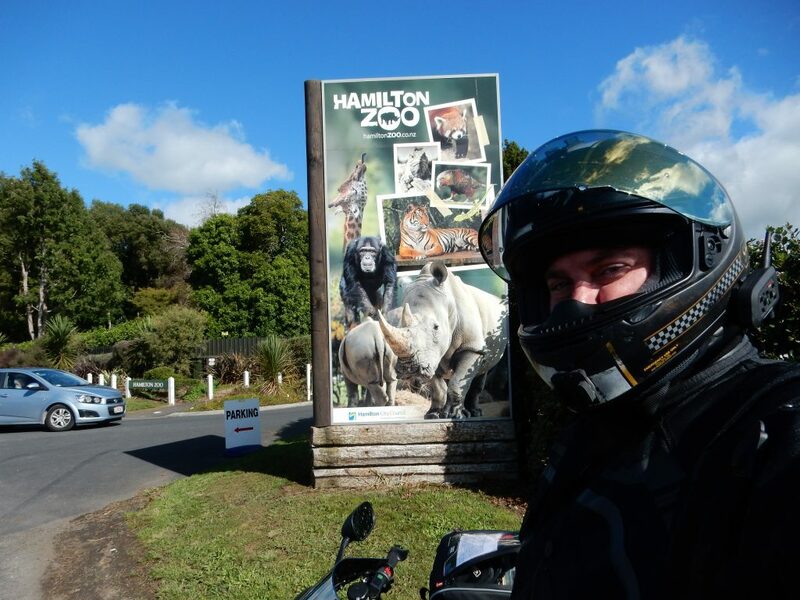 The two ZOO options available to me were Auckland or Hamilton. I needed to get a town starting with ‘N’ between ‘A’ and ‘Z’. I figured I could easily use A for my Auckland, and Hamilton Zoo for my Z, and there’s an N in between at Ngarauwahia. – That’s a pretty straight forward first three. There’s also a ‘C’ in Cambridge right next to Hamilton, so all that I was left trying to find was one more ‘A’, and 1600km in between. Recently we did the NZ TT2000 rally, which started and finished in Ashhurst. – That seemed like a reasonable ‘A’ to head for, and it’s miles away from Auckland, 509km to be precise. So there and back would only yield ~1000km, that’s not enough. 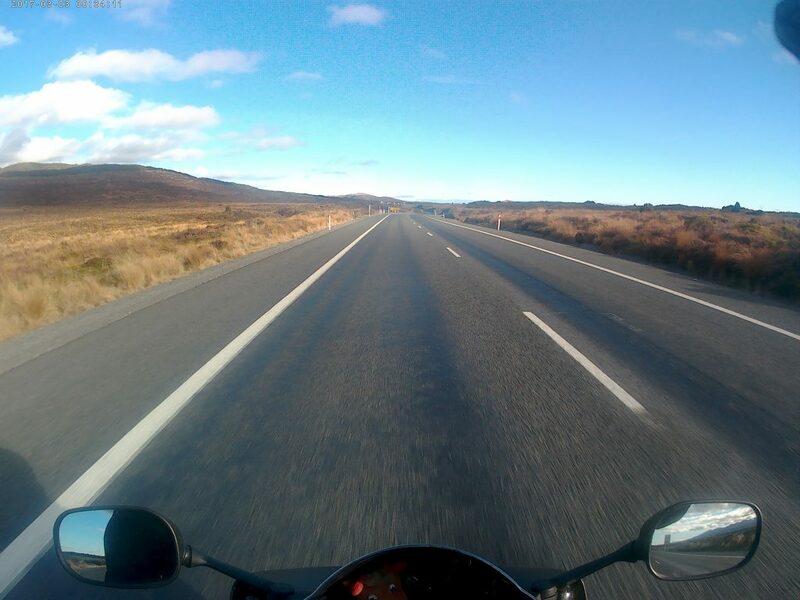 So I extended the ride, Northbound to start with; within the TT2000 rally we had headed up into and through Northland. State Highway 1 is really quite good up until Kawakawa after which it becomes a little more rural and twisty. Warkworth to Kawakawa return is an extra 300km. So I needed to create an additional 300km beyond that, which meant extending the route to the south too. I’d been in Warkworth on Tuesday, the day before the ride, and I’d managed to ride around and figure out a decent place to park the bike (with all of the gear loaded on it), a short and flat walking distance away from the war memorial (that area is significantly hilly). I knew they had road closures in place and so this was quite important to make the start of the ride stress and pain free. So with everything packed onto the bike the night before the ride, feeling like everything was ready to go, I had an early night and set the alarm for 4:55am. I needed to be out of the house by 5:30am, which would put me in Warkworth just before 6am which is when the ceremony was due to start. I find Dawn Parades to be very emotional, a sombre reminder of loss and sacrifice and of history which could so easily become overlooked and forgotten if we don’t actively take the time to remember and reflect. One of my favourite parts of this ceremony was the brass band’s playing of the two national anthems; a lady sang the words almost alone, as a solo; with such a lovely and light, airy voice. As 06:15am rolled around and the light was starting to gather I needed to make my way back to the bike and head off on my ride, so I quietly made my exit and walked away. When I got back to the bike I was all fingers and thumbs, trying to re-pack my camera, cellphone and sort out my ear plugs, helmet and gloves. It’s that starting excitement mixed with nerves and the uncertainty of how the next 24 hours are going to unravel. I had time and there was no need to be in any panic. 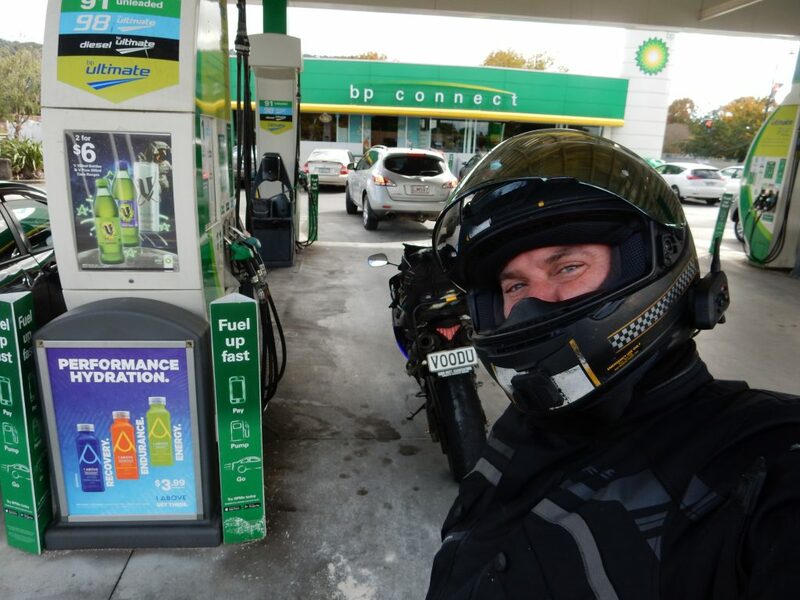 I knew that it would all settle down a lot once I actually got into it, so I headed off to the local BP station (~650m) where my ride was about to formally commence. When you’re getting set to go, you’re aware that your time officially starts at the receipt timestamp. So you want to make every minute count! Get everything sorted (as much as possible) before you go in and pay. GPS track cleared. – Check. Raah route tracking. Freshly re-started. – Check. SW Connect is running (yes, but wait; there’s points being buffered, hmm. ok close it, airplane mode, and back again, restart it.. ok they’re clearing now) – Check. Ride log book is open and ready, out of its waterproof bag, I have a pen handy. – Check. Grab a handful of Nuts and some water. Scoff, scoff – Check. Earplugs at the ready – Check, leave with Helmet and gloves. Right, go and pay for the fuel. 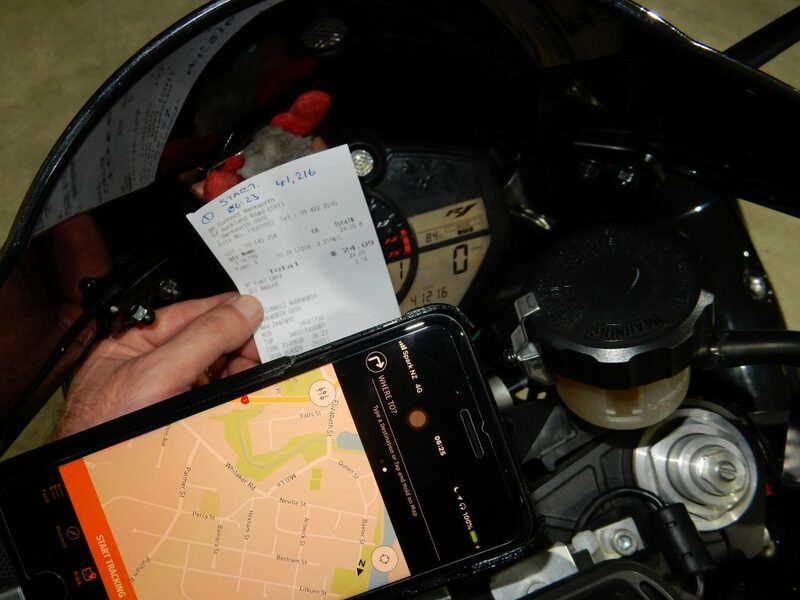 I’m part of the IBA premier programme and part of this is about working through some streamlined processes for ride verifications; we’re encouraged to take a photo of the fuel receipt, with the ODO recorded on it, in front of the ODO at the start and end points. – It establishes that the bike was used for the ride, and that it moved along that distance. 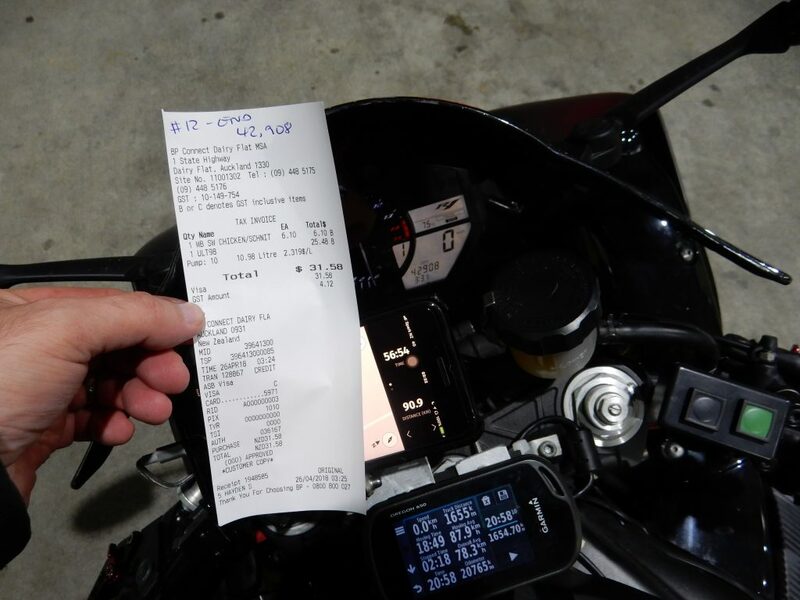 So, when I got back to the bike, I recorded the ODO reading on the receipt in Pen, then fumbled to get the camera out of its case and take a photo of it, showing the ODO. This is actually worth practicing, there’s a number of things which you can get wrong with this, focus, flash not showing the time on the receipt etc etc; I tend to have my phone mounted near my dash, and I don’t want to end up fumbling and dropping that, so I find it best to use a separate camera for this job, one with a flash to make sure the writing comes out clear enough. Finally, we’re done. Gloves, helmet… Doh, ear plugs… ok, now helmet… And we’re off. I love that initial settling in period. I find that I talk to myself a lot during this; ‘Right, ok.. We’re doing this. You’re ok. We’ve got this. (I may have a few friends in there with me, hence the collective ‘we’). It only takes a few kms, riding out of town, with the light breaking properly into the start of day; no sunlight yet, but you know it’s coming; there’s something really neat about being on your bike, riding and seeing that early change in light. I don’t know what it is which makes that so special, but it might be something as simple as ‘I’ve cleared my day for this; this is what I’m doing; nothing more, I’m simply riding my bike…’ – And to have such a simple and singular focus is a rare treat and something really quite cool. Coupled with the changing light and the feeling that ‘this is a new day’, anything can happen and we’re out there, giving it a go and doing it… I love it… bring it on. Shortly after the excitement of a new day had lapsed, reality kicked back in; it was 8 and 9 degrees on the way over to Warkworth, but on the way North before the sun properly showed up to start warming things up, it had dropped down to 7 and then 6. 8 felt cold, but 6 was another level. I was in summer gloves and my breathable leather jacket. I had three layers on top, but that wind cut through and my arms and chest were cold, as well as my hands. Half way up to Whangarei I knew that if tonight was going to be anything like that and if I was going to be exposed to that for hours, then I needed more layers and different gloves. My wife and I had spoken about glove choices the night before, I’d overlooked my ski gloves (which are actually two finger mitten motorcycling gloves – like the vulcan greeting, hand gesture). They’re properly wind and waterproof and have a thermal liner in them; why didn’t we remember them and pack them? 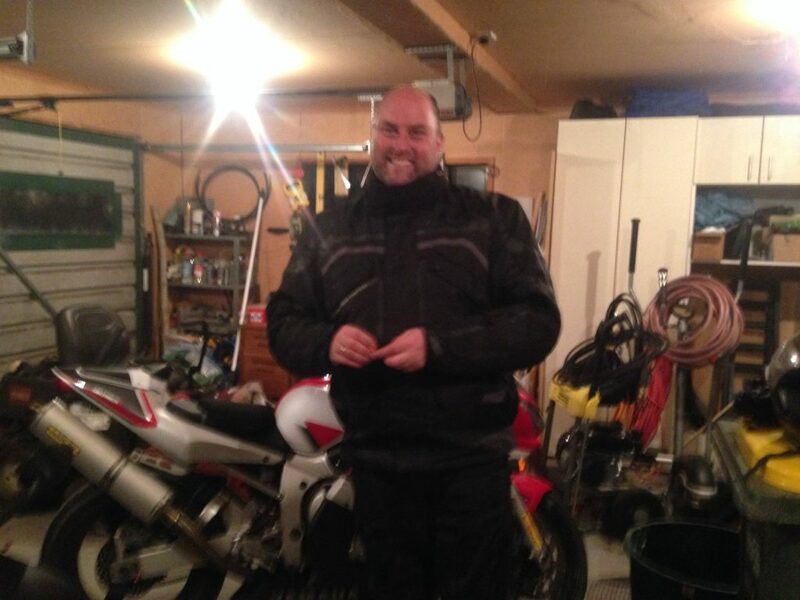 And the jacket – I have a wind and waterproof adventure style, armoured jacket – why didn’t I grab that one? Derrr.. The great thing about my planned route, was that even though I hadn’t planned to stop off at home again, I was coming back that way, so with a brief detour I could make adjustments like this before 10am. I had two hours up and two hours back to manage through; and it was due to get warmer during that time too. I saw 5 police cars within 10 minutes patrolling SH1 south of Whangarei, I took this as a sign of things to expect throughout the day. 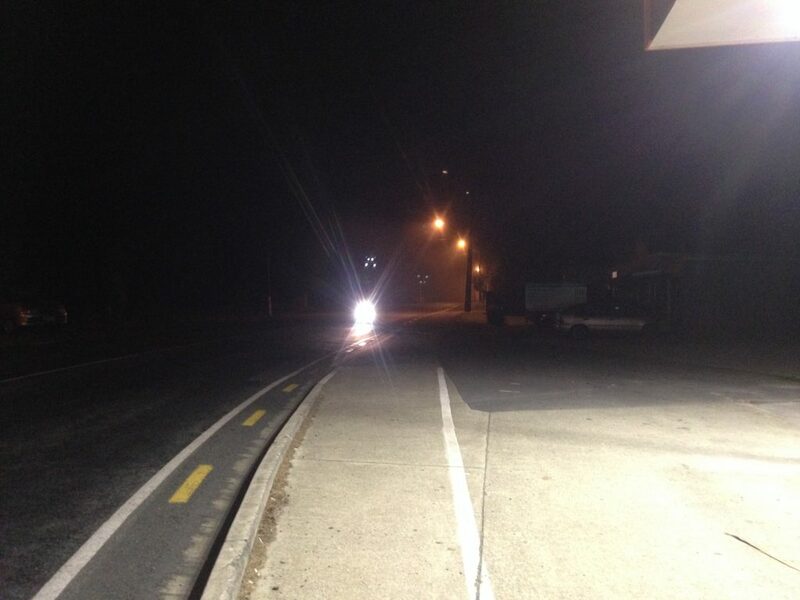 As I had been heading North, nearing my turning point in Kawakawa, a number of Ambulances had come hurtling past me in a Southerly direction. After I had filled up, returning south they’d shut the road down, closing all but one lane; there had been a horrendous two car-head on collision. https://www.nzherald.co.nz/northern-advocate/news/article.cfm?c_id=1503450&objectid=12039262 – that photo in the article is exactly how I remember seeing it as I rode past. I seriously didn’t expect anyone to have been taken away alive from that, but it appears that they may have survived it. That must have happened just minutes behind me as I was heading North. I was quite stirred by this scene. Click to see that photo in full size and zoom on the Whangarei heads in the distance, it really is spectacular. So Stella, my lovely wife and I had spoken a fair bit on the phone during the morning and she’d agreed to dig out my other gloves and jacket and leave them out for me while she went off to work. 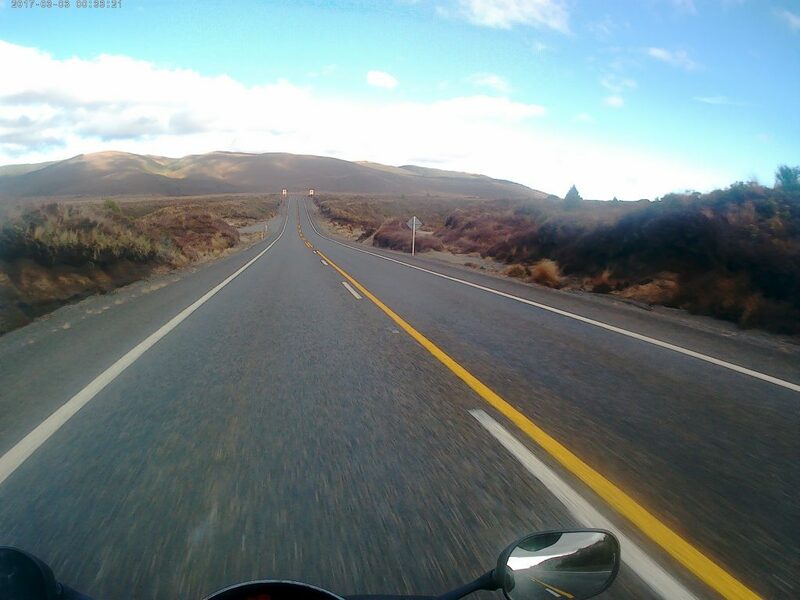 I went west down SH16 rather than continuing down SH1 as planned, turning at Wellsford. We’ve recently had issues with rubbish resealing work on SH16 conducted by Fulton Hogan, it’s some of the worst resealing I’ve seen, ever. Just south of Wellsford, after it had started to rain, I discovered another patch which was equally as bad, using the same coloured metal, it’s likely to have been done by the same crew. They have a terrible habit of leaving lose chip, uncompressed into the new tar sitting waiting for unsuspecting victims to ride over it; with rain on the visor, it was impossible to see the lose chip and I had a massive two wheel slide on this; I honestly thought it was all over rover. That stuff is lethal. I was considering whether I needed to add a change of underwear to that list closing items which I was due to grab at home. Thankfully I’m not often rigid on the bike, and I’ve found that this helps a lot when dealing with slides, I reckon you’re best to let the bike try to sort itself out as much as possible. That’s thankfully what happened this time too. It slipped, then gripped again. It’s not good for the pulse rate or the blood pressure though! Through the morning I had managed to become about 30 minutes ahead of my planned time, across the first four hours. Almost all of that got eaten up by the extra milage and the stoppage time at home. 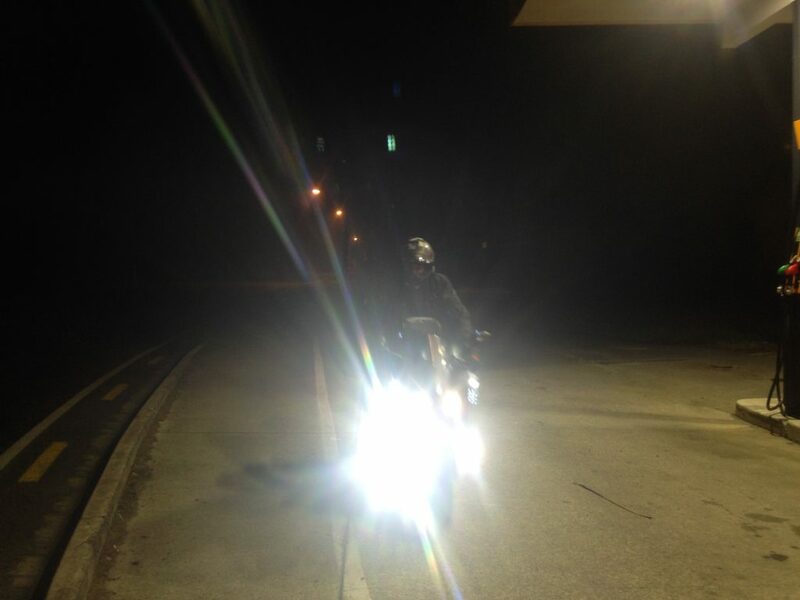 I figured this would most likely end up being time well spent though if the nighttime riding was cold. My ‘A’ – Auckland was straight forward. I had planned a city based petrol station stop which I could easily get to from the motorway which had good quick access back onto the motorway too. So it was a quick stop, grab a receipt, take a photo, and head off again, SH1 down toward Hamilton, stopping in Ngarauwahia for my ‘N’. 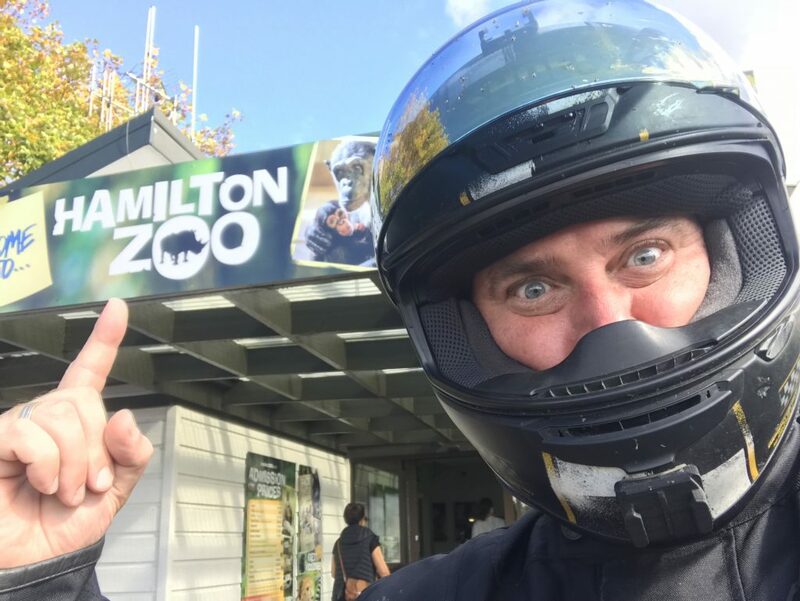 The Z in Hamilton ZOO, not only was a focus of much discussion on the IBA forum site, it was also one of the more interesting checkpoints to collect as I’d never been there before. I had to rely entirely upon my Garmin GPS to find the Zoo. Having never been there, I wasn’t sure where the best place to take a photo was, or where to try to park my bike while I attempted to get a receipt. 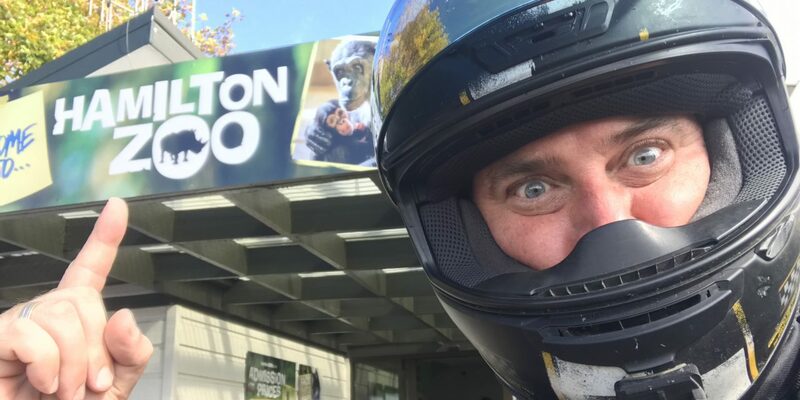 I was stoked, I was worried initially that the Zoo might not be open. If it wasn’t open, knowing how remote the Zoo is, there are no other business around it for miles, so I was concerned that I would struggle to get a receipt from anywhere nearby. This solved all of those concerns. 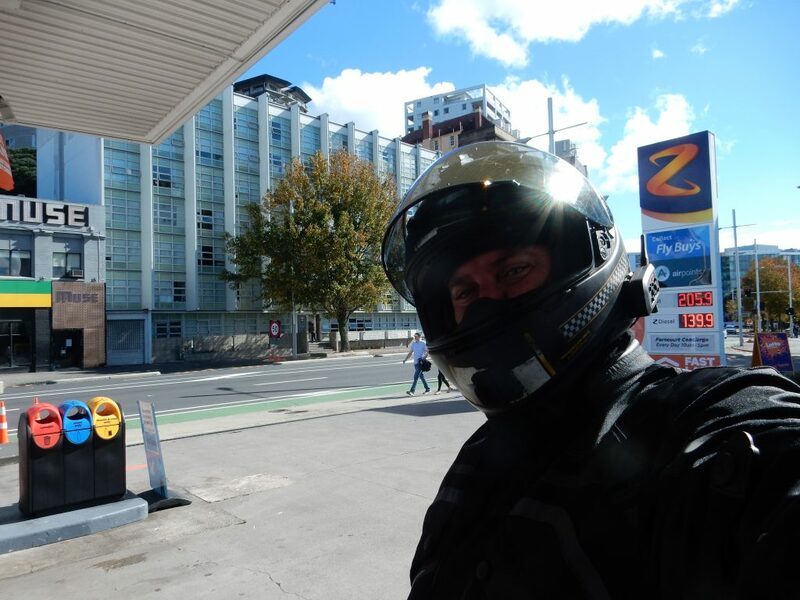 And so I was back on my bike, heading through Hamilton, trying to find a way to get back onto the main route to SH1. A.N.Z. had come pretty quickly in succession, but after the Zoo it was going to be a long time until I got my next ‘A’. After finding my way back onto SH1, the rest of the afternoon was an enjoyable mix of blue skies, flowing roads and moderate traffic. Excellent cruising conditions. 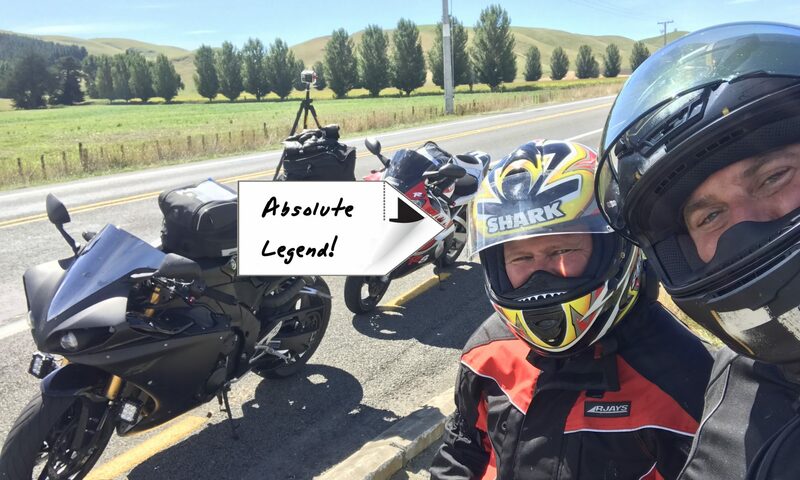 When I reached Taupo and the Lake came into view, I knew I needed to stop to put my video camera onto my helmet to grab some footage for you lot on the interweb. 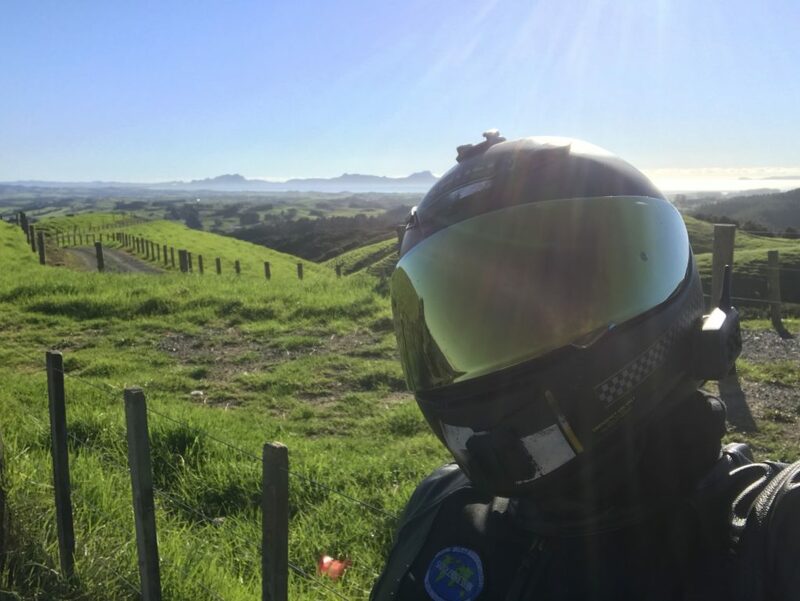 The sun was shining across the Lake, the sky was blue, I had music playing in my helmet – life was good and I wanted to share it a little with you all. Lake Taupo is at 356m above sea level, beyond this section of road around the lake the road climbs upward towards a section of road known as ‘The Desert Road’. At an elevation of 1074m the Desert Road crosses the Central Plateau for 70kms from Turangi in the north to Waiouru in the south, running between the mountains of Tongariro National Park in the west and the Kaimanawa Ranges in the east and passing through NZ Army land around the summit area. This road runs to the South East of Mt Ruapehu, the largest mountain and ski area on the North Island. The summit of Mt Ruapehu is 2,797m above sea level, the ski areas are at around 2,300m. This whole area gets really cold in winter, with the Desert Road regularly being closed due to weather / snow. April doesn’t normally see freezing levels across the plateaux but we came really close on the return trip. I had loosely arranged with a friend, David that he might meet me somewhere on the way down to Paraparaumu, my ride’s most southern point (which is where he lives). During the afternoon we had been in touch and figured out where he’d likely make it to within his available time, and so we were planning to meet up at Taihape. He made better progress than I had and so he continued on another 10 or so minutes; we were tracking each other with ‘Find My Friends’ on the iPhones, and knew pretty much where our paths would cross. It worked out well, he had space to swing his bike around and quickly caught me up. 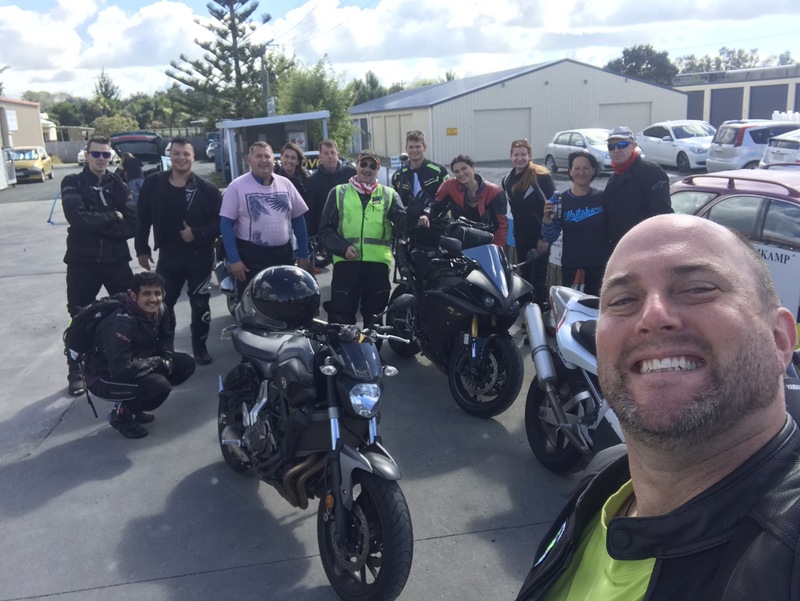 We were about 2.5 hours north of Paraparaumu at this point, stopped in Taihape to refuel and grab a quick bite to eat. Joy of joys, I got ‘that guy’ in front of me, who fills his truck with diesel (in a BP), and tries to pay with a Caltex fleet card, then has no other way to pay for it… You win a prize, stoopid! For the rest of the ride down to Paraparaumu, David and I sat with our comms connected through a cell phone call, you’ve gotta love unlimited call plans! it was a very pleasant break from talking to myself. I really did appreciate him coming out to meet me and riding back with me; it really helped to keep me positively focussed. Thanks heaps David! By the time we got to my turning point at Paraparaumu, my Rever tracking app showed that I’d done 1007.7kms, another major milestone. Turning to head North, I became reliant upon my GPS again to take me along a route I’d never been before, up to Ashhurst, approaching from the South. I called another rider, Andrew Thomson and arranged with him my ETA in Ashhurst. I’d never met Andrew but he offered to head out for a bit on Facebook and I was again delighted to have some company on my ride. Ashhurst was my second ‘A’ stop (ANZAC). Andrew rides a GTR 1400 Concours, a bike which has grabbed my eye since I first noticed them being used as a camera bike in the Tour De France cycle racing. I’ve loved how chunky and solid they look. 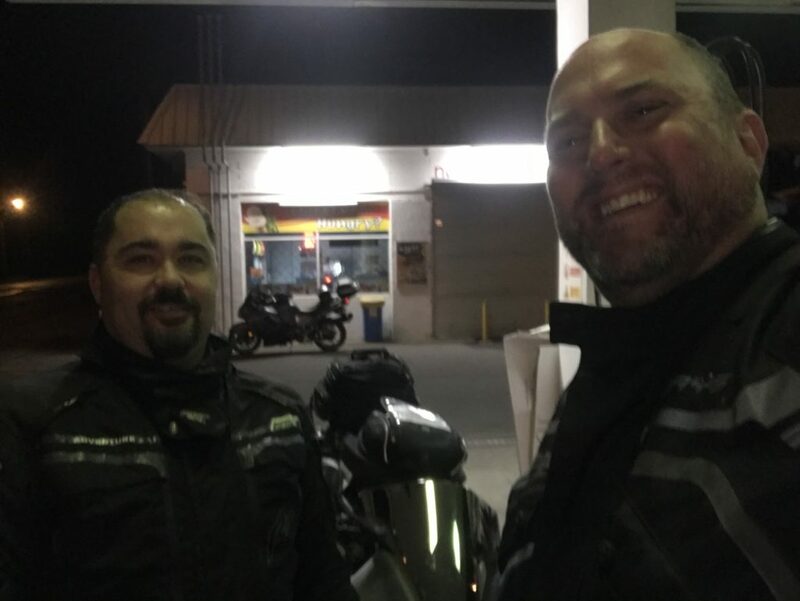 It was great to meet a fellow rider and make a new friend, and super cool of him to head out at 8:30pm to hook up for an hour or two’s ride on a school night. 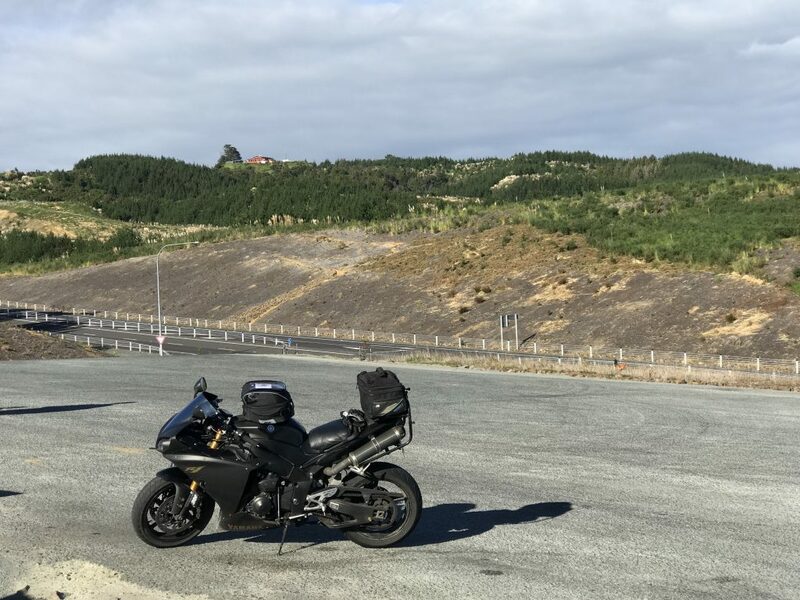 🙂 – He helped me to find my way through the lesser SH roads between Ashhurst and SH1 at which point I left him as he returned home, and I headed on for my final ~500km. – Thanks Andrew – nice to meet you! I was so glad to have had some company at this point, but the rest of the way home was going to be mine alone to conquer. Andrew left me at 9:15pm – I still had 6 hours to go. Ashhurst was an unmanned, pay at the pump fuel stop, so I had no chance to get any food there. As I headed towards the Desert Road area, I was starting to get cold and a bit hungry; so I took an unscheduled stop at a Z station to grab something hot to eat, change my gloves and put my neck warmer on. 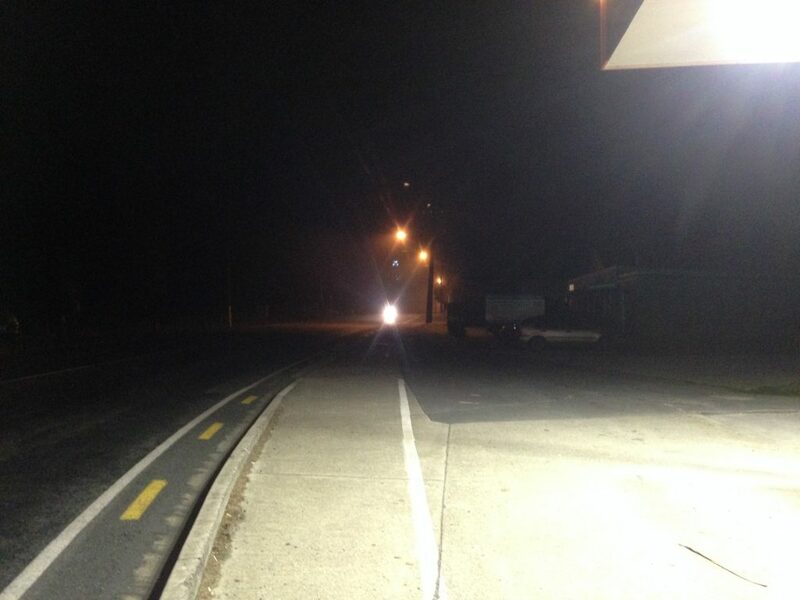 It was 3 degrees as I approached Waiouru. The temperature dropped even further over the Desert Road, it hit 1 Degree for a while over the top. When you’re ‘dealing with things’ I find it’s helpful to set short term goals, things like, “I’ve only got 45 more kms to get to my next fuel stop, I’ll have a hot drink and a bite to eat there, and life will be good and not quite so cold…” – All very well until you get to the 24 hour fuel station and find that it’s a solo attendee who’s not interested in anything other than taking payment through the night pay, they won’t open the doors for you, and they’re certainly not employed to make drinks… Hmm. Ok, never mind, on to the next one then. My wife was excellent, taking phone calls from me as I settled into the real night portion of my ride. I had struggled past this one truck three times now (he refused to throw his high beams on and was travelling at that awkward speed point where it’s not quite fast enough, so you want to pass him, but it’s fast enough that if you get it wrong and mis-judge what’s in the black infront of him, then you know it’s not going to end well. 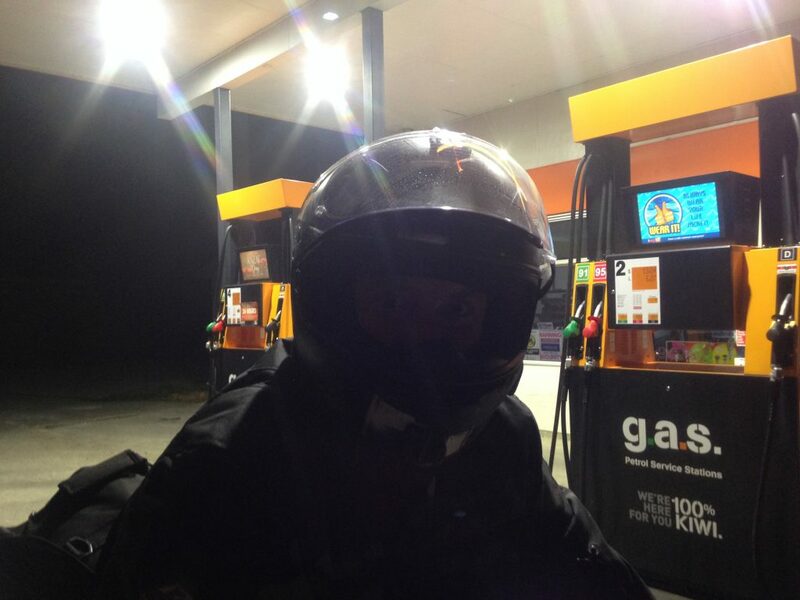 – So each time I had to take my time and really work at looking past him, using my GPS view too to know which way the road was going next etc; … Each time I stopped for fuel, he would catch me and pass me again. Grrr. Professional drivers, yeah right. He was the worst of the lot that I came across on the whole trip, and it just so happened that I was repeatedly exposed to him. 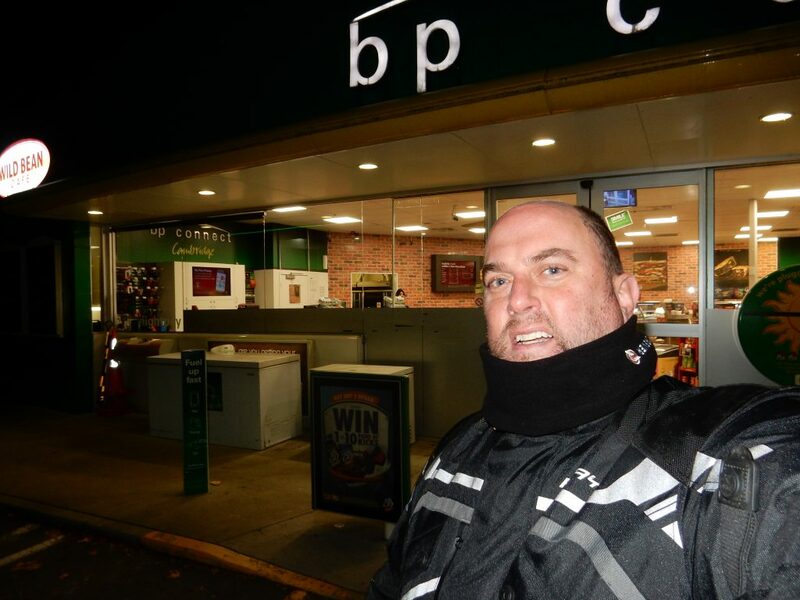 Wairakei BP Truck stop was my unplanned, backup stop – I needed a hot drink, they had barista staff on even at 23:50hrs, you rock! Thank you, it truely hit the spot. Shortly afterwards, I felt SO much better and I set off on my way up North. My GPS died as I was selecting my next waypoint (I was stopped). It needed a battery out, reboot to come right. I didn’t loose any of the track (not important if I had, it was only for a backup anyway). On the way North, I hit the limit of Rever’s ride tracking. The APP ‘self-closed’ (crashed) and I pulled over to re-start it when I noticed that the screen gone black. This is the second Saddle Sore when I’ve had that same problem at roughly the same point in the ride, so there must be a per-ride limit that they can hit without them handling an issue gracefully. I guess those limits aren’t tested / hit that frequently. Coming into Auckland, the motorway was shut for one junction, so we detoured around the closed section. 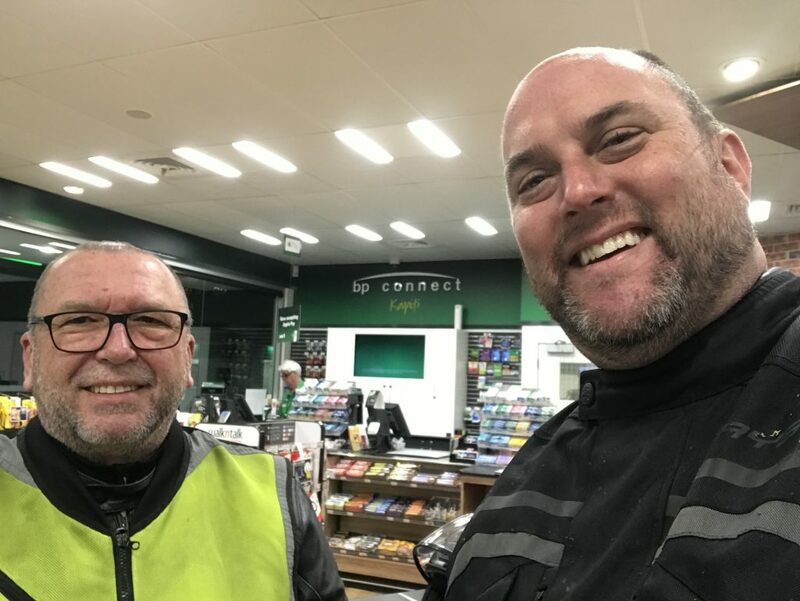 Stella, my lovely wife drove out to meet me at one of our local villages, while she was heading out, I stopped at one of the main service stations on the motorway to perform my last fuel fill and to grab my formal end receipt. I had completed enough kms at this point to finish if needed, but I carried on logging my SPOT track on the journey home and clocked up another 35km towards my total ride distance. 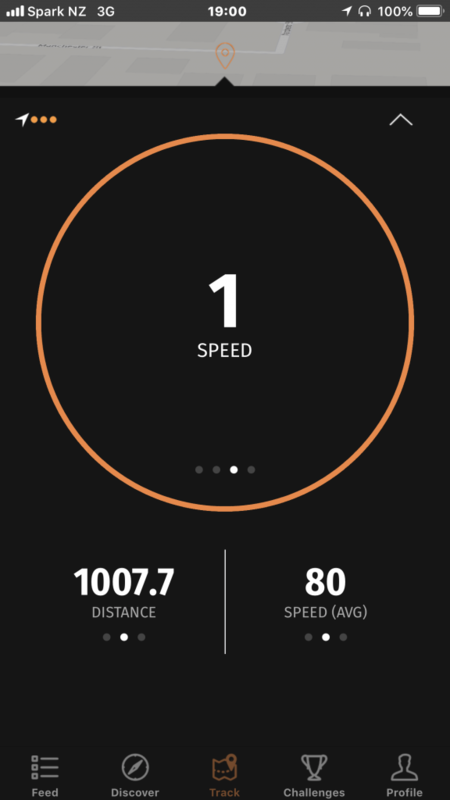 Here’s a full summary of my ride taken from my SPOT track. This is the first ever Saddle Sore ride I’ve done on my own. My others have had company for the whole ride. This was a very meaningful ride for me, not only for the challenge which it posed, but also because of what it stood for. I was happy to rise to the challenge of the Australian IBA, it’s members and management and was very grateful for the chance to participate in such a meaningful, memorial ride. – So thanks guys for the chance, and the call-out to step up and do it. So, how may others did the ANZAC ride this year? I think there was at least one of the Aussie crowd who had plans… I’d love to hear about your ride too! I hope you had a good one, stayed shiny side up and got home safely? I came across your blog through a freind of mine you know, Andrew the Bandit Rider from Palmerston. 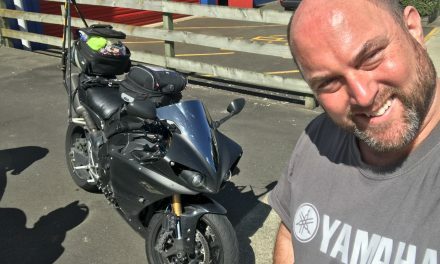 I run my own blog here in Australia and also ride an 00 and 15 R1. You sir are a complete fruit loop. 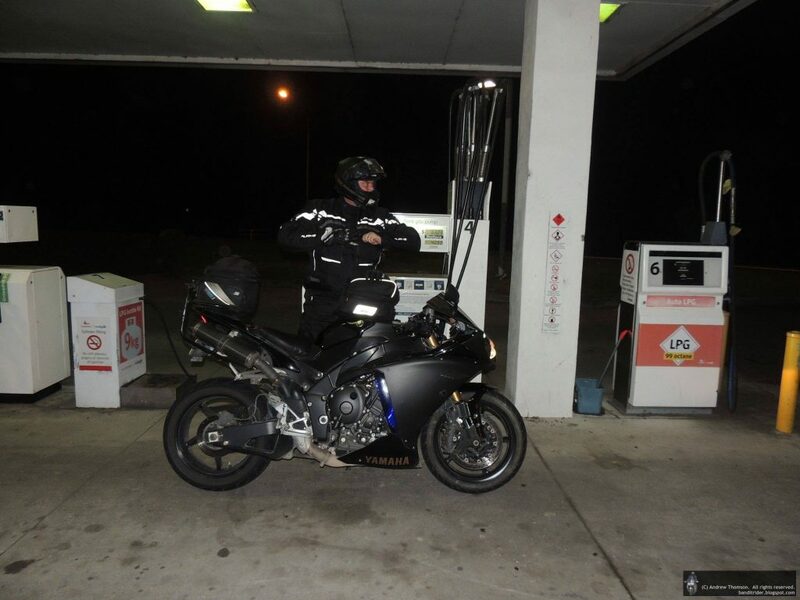 I’ve never seen anyone ride an R1 1600km in one day. 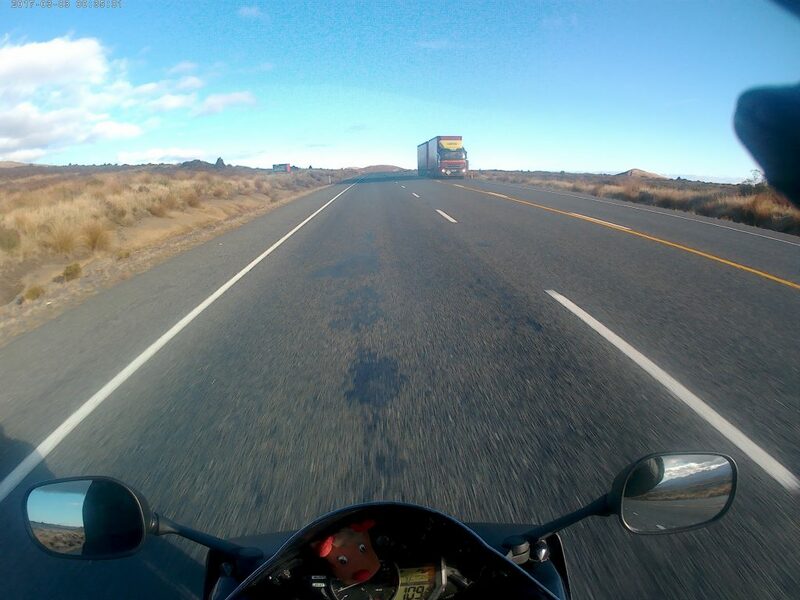 The most I’ve done on mine is about 760km and I was well munted. Congrats on the effort and I can honestly say I don’t know how or why you do it, lol. Nice to ‘meet’ you. I hope our paths cross at some point in future! Nice read, great ride, and outcome. 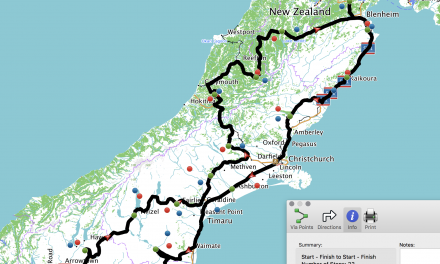 Great ride and read Chris – This is what it is exactly about, Hagar and I designed this ride for NZ and Oz riders to complete a very Specail ride. Well done mate.